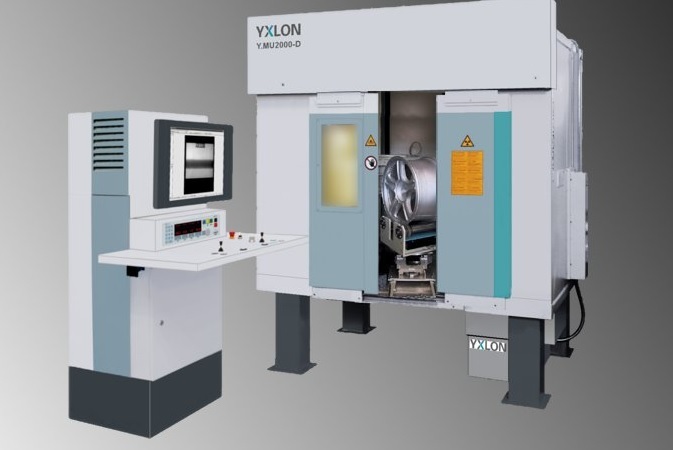 The Y.MU2000-D X-ray system with “Wheel” option is the ideal alternative for spot-check sample tests when the high throughput exhibited by the inline wheel inspection system Y.MU231 is not required. Compact design, the newest radiographic technology and easy operation at a reasonable price are the convincing advantages displayed by the Y.MU2000-D system with “Wheel” option for wheel inspection. In addition, inspections performed in real time mean a distinct reduction in both time and costs. Y.MU2000-D is the perfect X-ray system when it comes to spot-check sample testing in wheel inspection. The wheel is placed on a roller stand for inspection which can be moved horizontally. The X-ray tube and detector are mounted on a U-arm that can be tilted and travels up and down. This manipulation system enables all of the necessary views for inspecting the wheel. As an option, the image enhancement and archiving system Y.IMAGE x500 can be integrated in order to edit the X-ray images of the wheel and save them in digital formats.